Congratulations on your upcoming or recent arrival! CSUN is committed to promoting a family-friendly environment by providing programs and services to help students and employees achieve success at the university and in their personal lives. In supporting a family-friendly environment, CSUN recognizes the importance and benefits of breastfeeding for both mothers and their infants. Pregnant, parenting and lactating students, faculty and staff are protected under our CSU anti-discrimination/anti-harassment policy. If you have any questions or concerns relative to support and accommodations, please contact the Title IX Coordinator in the Office of Equity and Diversity at (818) 677-2077 or . On March 23, 2010, the Patient Protection and Affordable Care Act (PPACA), also known as the 2010 health care reform legislation, was signed into law. Section 4207 of the PPACA amends Section 7 of the Fair Labor Standards Act (“FLSA”) to require employers to provide a break each time an employee needs to express milk, in a location other than a bathroom, that is shielded from view and free from intrusion by coworkers and the public for up to one year after a child’s birth. There is also no upper age limit. If you need assistance with locating an available private space for lactation purposes or have any questions, please contact Human Resources and/or your department. Supervisors are encouraged to work within University policies regarding breaks and hours of work to accommodate employees who wish to express milk during work hours. Generally, lactating mothers need 2-3 lactation breaks during an 8-hour work period. A reasonable amount of time for a lactation break are generally around 30 minutes per break and includes the time associated with travel to and from the lactation space, expressing milk, clean up, and storage. Decisions should be made on a case by case basis. Consider schedule options that would accommodate this leave time, and still allow for business needs to be accomplished. A variety of flexible work arrangements can be used for the purpose of accommodating lactation time, such as alternate start/stop times to the workday, rearranging break periods, etc. The lactation break time for non-exempt employees may run concurrently with the employee's existing rest period. If it is not possible for a lactation break to run concurrently with the rest period, the University must make available a separate unpaid break time. For non-exempt employees, this is neither time worked nor time on pay status. Breastfeeding significantly improves health outcomes of the breastfeeding mother and her baby. The American Academy of Pediatrics reaffirms its recommendation of exclusive breastfeeding for about 6 months, followed by continued breastfeeding as complementary foods are introduced, with continuation of breastfeeding for 1 year or longer as mutually desired by mother and infant. 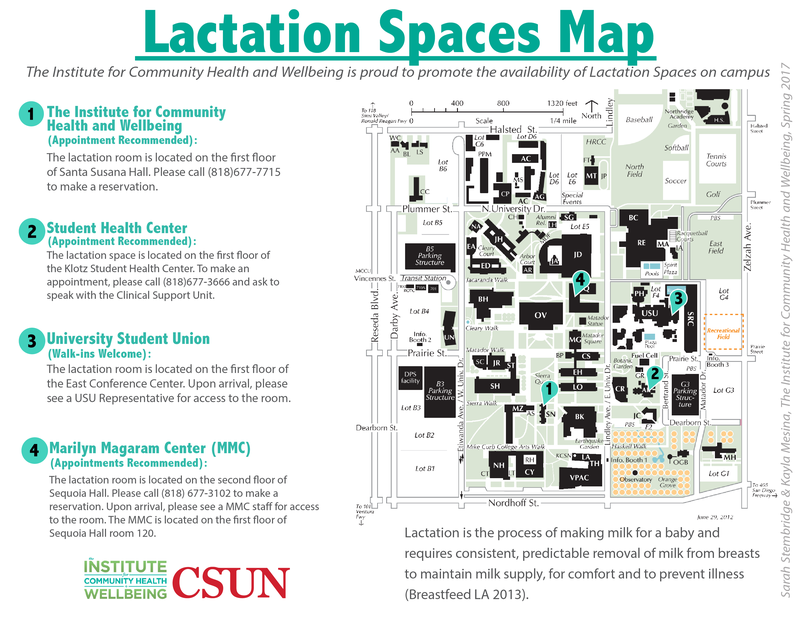 Providing students and staff with support to continue breastfeeding when they return to work or go to school at CSUN. Helping staff return to work successfully and combine breastfeeding and working. Providing pregnant and breastfeeding students with the education and support they need to reach their breastfeeding goals.